Menorca is a Balearic island with many faces, it belongs to Spain and has little in common with its big sister Mallorca. 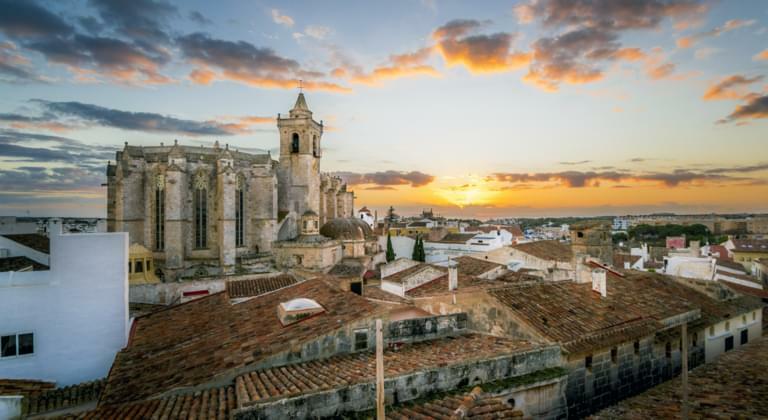 In Menorca, nature is still largely intact because the island is hardly affected by mass tourism and offers its visitors a traditional Spanish way of life. The Balearic island offers a very varied coastal landscape, with beautiful sandy beaches alternating with rocky stretches and natural harbours. For nature lovers, beach tourists and families with many children, Menorca is a real holiday paradise with attractive sights and a wide range of leisure activities. Rent a car at the Airport Menorca and discover the island. The island's capital Mahon offers an exciting historic old town for exploration and is home to the world's second largest natural harbour. If you have succumbed to the charms of Menorca and want to spend your holiday in unspoilt nature, you will probably choose the fastest and most comfortable way to get here by airplane. How far are the distances from Menorca airport? In the following article we describe the Aeropuerto de Menorca and explain how to find your favourite car rental company. You could rent a suitable car on our website and want to explore the island directly from the pick-up point. The airport on the island of Menorca is one of the three international airports in the Balearic Islands. It has only one terminal and is mainly frequented by charter aircrafts from the European mainland during the high season. Since 1969 it has replaced its predecessor San Luis airport, which is currently used for a few general flights. However, you can also fly from Menorca Airport to Mallorca, Barcelona or other destinations in Spain. San Luis airport, located closer to Mahon, was no longer able to cope with the continuous growth in passenger traffic 50 years ago. It now records only about 3,000 aircraft movements per year and is also used for leisure aviation. Menorca's new airport has 25,000 aircraft movements per year, with more than 2.7 million passengers taking off or landing at the airport. The airport has the IATA code MAH, is mainly used by German, Spanish and English tourists and has two runways. You can specify details such as model, rental period, accessories and insurance benefits in advance. This saves a lot of time after arrival, because you only have to inspect and receive your cheaply rented car at the pick-up station of your car rental company. The airport bus will take you to the only terminal where the baggage claim area is located on the ground floor. Ideally, you will find your car rental company close to the luggage belt between lost-and-found office and tourist information. Renting a car cheaply through Driveboo.com results in only a few formalities at the counter of the car rental company. Your rental agreement has already been prepared and you only have to check the details for completeness. It is also possible that your car rental company is located on the airport premises and the pick-up point is outside the airport. In this case, please use the free shuttle bus from the terminal. If you book with us, you will be well informed about the exact location of your car rental company and know the location of the pick-up station. In addition, you can rent your favourite car at a very reasonable price, as we pass on all discounts to our customers.